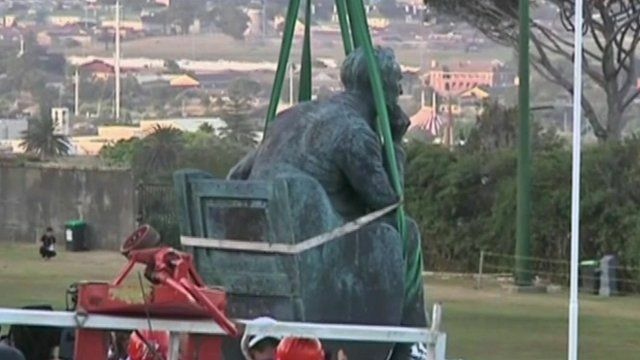 Rhodes statue in Cape Town removed Jump to media player A statue of the British colonialist Cecil Rhodes has been removed from the campus of the University of Cape Town in South Africa. Can surfing beat gun crime in S Africa? Jump to media player Youngsters from one of Cape Town's gang-ridden townships have taken to riding waves in a unique project aimed at getting them away from a life of violence. Life in Cape Town's notorious gang area Jump to media player South Africa has one of the highest murder rates in the world and drugs and gun crime fuel the cycle of violence in the Cape Flats, an area notorious for gangs. Fighting for their land, 20 years on Jump to media player Nomsa Maseko reports on the Cape Town residents still fighting to get their land back, 20 years after the end of apartheid. A statue of the British colonialist Cecil Rhodes has been removed from the campus of the University of Cape Town in South Africa. Students celebrated after they had staged months of protests. They say that the statue is a symbol of institutional racism. Mohammed Allie reports from Cape Town. Go to next video: Can surfing beat gun crime in S Africa?